Listening to climate campaigners, you would think that Hurricane Sandy, already downgraded to a tropical storm, was something that never happened before in the United States. While damage has indeed been severe for a number of reasons I discuss below, winds are already slowing due to drag produced as the storm moves over land. In fact, there have been many storms far more powerful than Sandy, which, by the time it hit the coast of the U.S. was barely a category 1 hurricane. ICSC Science Advisory Board member, Dr. Tim Ball, environmental consultant and former climatology professor, University of Winnipeg, explains that Sandy’s upgrading to even this level was the result of one measurement from a hurricane hunter aircraft extrapolated down the surface, not a direct measurement of the wind speed at the surface. 1 – its very low central pressure, a general indicator of storm strength, set records in several cities (Atlantic City – previous record low was in 1932, Philadelphia – previous record 1993, Harrisburg, PA – previous record 1913, Scranton, PA – 1965, Trenton, NJ – 1993, and Baltimore – 1932). This led to significant rises in sea surface elevations under the storm. Sea level can rise as much as two meters due to extraordinarily low air pressures above the ocean, which effectively “pull up” the sea surface in the vicinity. Note that low pressure records were not set in several major cities impacted by the storm. Here is when those records were set: Newark, NJ – 1993, New York, NY – 1914, Washington D.C. – 1993, Lynchburg, VA – 1932, Elkins, WV – 1965. 2 – strong onshore winds on the north side of the cyclone. 3 – the fact that the storm hit many coastal areas at roughly the same time as high tide in these regions. 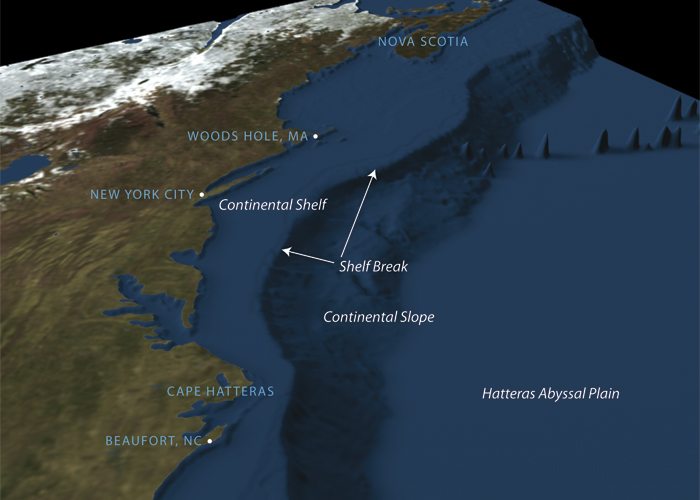 4 – the fact that, as the storm moved north of Cape Hatteras on the coast of North Carolina, it started to travel over regions of wider continental shelf (see image below) where the ocean is shallow for greater distances off the coast than further to the south. This tends to focus waves that then grow to higher heights than when they are travelling across deeper ocean regions. 5 – perhaps most significant, the northern Polar Jet Stream pushed down into the Southern U.S. and presented a wall of cold air that Sandy ran into, prolonging its stay over the Eastern Seaboard and diverting its path into the coast more than would otherwise be the case. Click on the below image to watch an animation of this phenomenon (select Length of animation = 5 days, Interval between images: 6 hours). This was compounded by a high pressure zone over Greenland, also holding Sandy in place longer than would have been the case otherwise. Much of this is associated with global cooling, not warming. The fact that the storm hit when the Earth, Sun and Moon were lined up also added slightly to the maximum extent of high water levels. For people who have been following the science debate, none of this should be surprising. The August 29, 2011 Nongovernmental International Panel on Climate Change report (NIPCC – see www.nipccreport.com) concluded “…the data reveal there have not been any significant warming-induced increases in extreme weather events.” The report showed that this was the case whether the phenomenon was precipitation, floods, drought, storms, hurricanes, fire, or other weather-related events. Dr. Khandekar, an NIPCC author, demonstrated that extreme weather events are now occurring with about the same frequency as they did during 1945-1977 cooling period. Instead of vainly trying to stop extreme weather such as Tropical Cyclone Sandy from happening, we need to harden our societies to these inevitable events by burying electrical cables underground, reinforcing buildings and other infrastructure and ensuring reliable energy sources so that we have the power to heat and cool our dwellings as needed. In the meantime, there is no excuse for most of the power failures. Year in and year out, we see parts of the electricity infrastructure fall apart in storms that meteorologist tell us are inevitable from time to time. Power companies should simply pay more attention to preventive maintenance and better harden our power supply by burying more electricity transmission cables underground. Climate change should be an issue in the U.S. election, all right. But we shouldn’t be discussing greenhouse gases reduction in a futile attempt to stop climate from changing or extreme weather events from happening. Instead we should be discussing how best to prepare our growing societies for extreme weather like Tropical Storm Sandy, events that will continue to occur no matter what we do. Tom Harris is Executive Director of the International Climate Science Coalition – http://www.climatescienceinternational.org/ and an advisor to the Frontier Centre for Public Policy in Winnipeg, Manitoba, Canada.